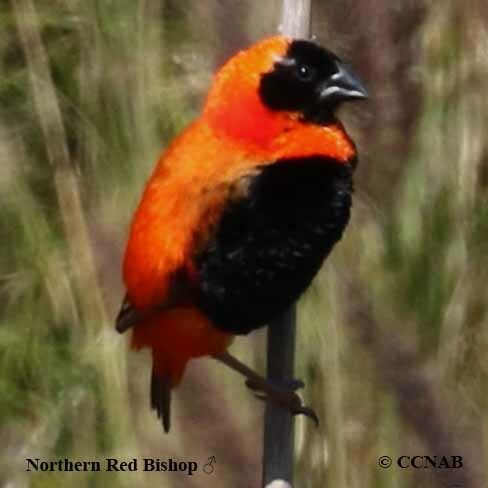 Species: The Northern Red Bishop, once known as the Orange Bishop (Euplectes franciscanus), is an exotic bird, native to northern Africa, and a member of the weaver family. 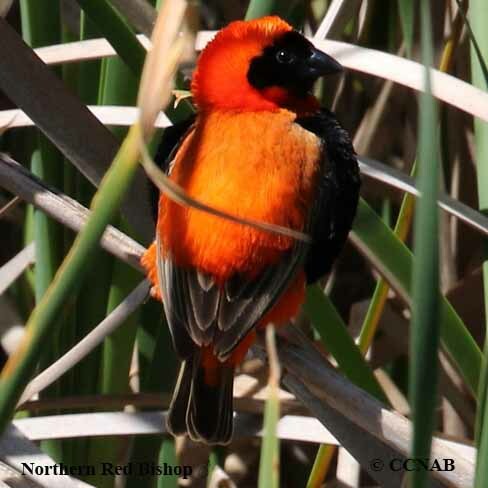 This bird species has been reported in Miami, Houston, Phoenix and Los Angeles. In most cases, these are escaped bird sightings. There is a breeding colony in Houston, Texas. 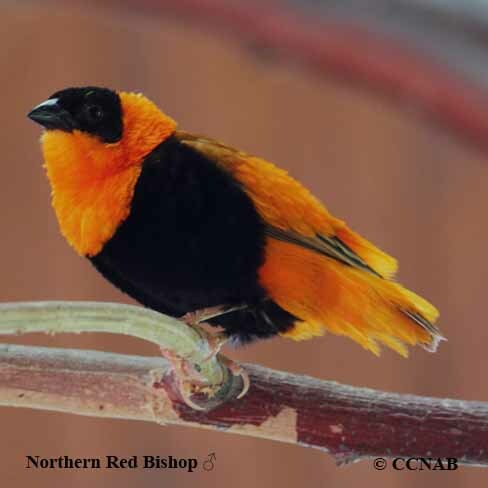 Distinctions: Sexually dimorphic, the male has a reddish orange body, black face and crown, black breast and brown wings and tail tip. 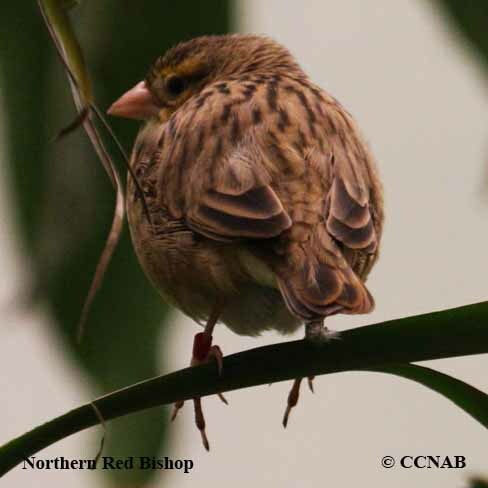 The female is sparrow like in appearance, light brown overall, with slightly streaked breast, juvenile similar to the female and the male, when the male is in non-breeding plumage. Voice: Soft single note, sparrow-like in sound. Nesting: Four to five aqua blue eggs per clutch. Nest is constructed on to a group of stronger plant stems, weaved into a hive like enclosure, using grass and hay like materials. Male may have multiple female mates at the same time. Distribution: Seen in the southern states, where the temperatures are somewhat similar to their native homes. 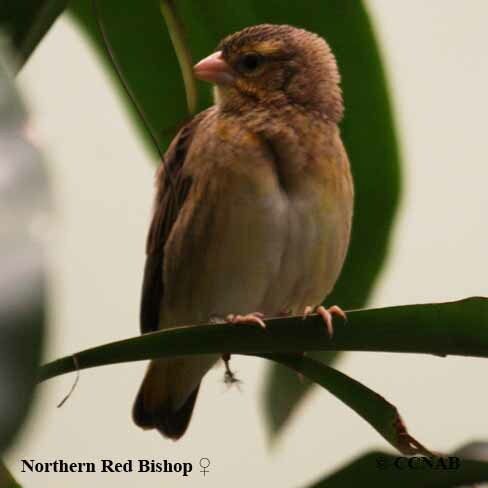 Reported across the southern states, mostly likely escaped birds. There is a breeding colony located in the city of Houston, Texas, and another one in Phoenix, Arizona.